We have made an all-natural moisturiser for the face which is full of powerful anti-oxidants and then stirred through 19% of Zinc as the natural sun protection active. We do not use UV filters in this cream. The first thing people notice is the colour. It is a light tan colour as it is full of genuine natural anti-oxidants, and these are not always white. We also use Red Raspberry Seed Oil for natural SPF in the formula which is bright red. Secondly it is quite thick due to the natural actives and Zinc. However we find it spreads really easily. There are two ways to achieve sun protection. Firstly UV filter chemicals can be used which absorb UV radiation. We again urge people to do a little bit of their own research into UV Filters. The second way is to use a physical barrier using either Zinc Oxide or Titanium Dioxide that reflects the radiation. We chose to use only Zinc Oxide only to reflect radiation. Then for anti-ageing, we needed to help stop the free radical damage that contributes to visible signs of ageing. Why the fuss about anti-oxidants and free radicals to Prevent Ageing? Free radicals have an electron missing and cause cell damage when they "steal" an electron from other atoms. Anti-oxidants pair up with these free radicals helping prevent cell damage. Free radicals are created as an essential part of life when food is oxidized to create energy, and also from UV radiation or other stress such as smoking. They are highly charged oxygen that cause "oxidisation". If you've seen a peeled apple turn brown, you've seen oxidation in action. Oxidization can also cause other health problems in the skin. Antioxidants help prevent oxidization by mopping up free radicals. As antioxidants block the effects of free radicals, they end up being oxidized themselves. But better the ingredients than your skin, right? This is why it's important to constantly replenish your supply of antioxidants. Please note: None of these studies were conducted by us. They are all performed by researchers from various universities. That is the theory and there are lots of anti-oxidants, but putting any old anti-oxidant on the skin won't work. Firstly the ingredient needs to be stable enough not to combine with the oxygen in the air, and secondly it needs to penetrate into the skin sufficiently to work. So which ones do work, and which are only marketing hype? Rather than a glossy brochure or vague reference to "studies", we think it would be better to see what independent researchers have found about these two ingredients when used topically. EGCG actually looks like a white powder by the time it is purified from Green Tea. Normal Green Tea would do very little on the skin due to the low concentration of EGCG and other polyphenols. Photoprotective effects of green tea polyphenols (EGCG). "The available evidence indicates that green tea has many biological effects that ameliorate the damaging effects of both UVA and UVB radiation. These biological activities differ from those of traditional sunscreens. Green tea polyphenols thus have the potential, when used in conjunction with traditional sunscreens, to further protect the skin against the adverse effects of ultraviolet radiation."Reference. Dual mechanisms of green tea extract (EGCG)-induced cell survival in human epidermal keratinocytes "EGCG increased the epidermal thickness of aged human skin in vivo ..."Reference. Effects of polyphenols on skin damage due to ultraviolet A rays: "These results show a protective effect of EGCG when applied topically before UVA exposure." Reference. Topical Caffeine is a white powder. That doesn't look as nice so here is some coffee to perk us all up after this scientific reading. This oil is a rich dark red and so is one of the reasons our cream is a tan colour. It contains very high levels of Vitamin E (and we also add extra natural Vitamin E) as well as Vitamin A and Omega 3 and 6 Fatty Acids. This reportedly helps provide extra protection from UV. Raspberry Seed Oil contains exceptionally high levels of alpha and gamma tocopherols (vit. E), vit. A and omega-3 and omega-6 fatty acids. This provides the skin with significant broad spectrum protection from damaging UV-A and UV-B rays." One of the key signs that skin has been exposed to a lot of sun over the years is areas of hyperpigmentation, age spots etc. Niacindamide is a widely studied ingredient that si used to help protect the skin from hyperpigmentation following UV exposure. This cream is tinted brown due to the natural ingredients added. We designed this cream to be thick and moisturising to protect the skin from drying out . Best applied after washing the face. After 3-5 minutes check in the mirror and smooth out any areas of extra cream. Enjoy Summer! 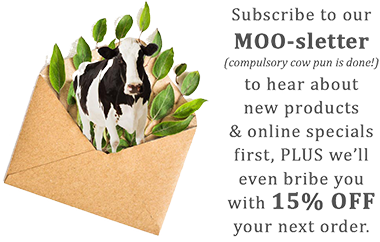 MooGoo is proud to show ALL our ingredients on our website and packaging, not just the "Actives" or nicest sounding ones. Aqua (H2O's Fancy Name), Zinc Oxide (For Sun Protection), Simmondsia Chinensis (Jojoba) Seed Oil, Glyceryl Isostearate (Emollient), Polyhydroxystearic Acid (Emulsifier), Squalane (Olive), Cetearyl Alcohol (Plant Based Emulsifying Wax), Aloe Barbadensis Leaf Juice (Aloe Vera), Niacinamide (Vitamin B3), Tocopherol (Natural Vitamin E), Piroctone Olamine (Olamine Salt), Rubus Idaeus (Raspberry) Seed Extract, Guar Hydroxypropyltrimonium Chloride (Guar Gum), Allantoin (Comfrey Root) Extract, P Anisic Acid (Natural Preservative), Glyceryl Stearate (Emollient), Potassium Sorbate (Natural Preservative), Caffeine, Hyaluronic Acid, Humulus Lupulus (Hops) Extract, Camellia Sinensis (ECGC Green Tea) Leaf Extract . Zinc Oxide (For Sun Protection) Zinc Oxide is a mineral with many healing benefits to the skin, as well as being a natural sun protection barrier. Zinc Oxide doesn’t break down on the skin or dissolve in water, instead it sits on the surface of the skin and reflects UV A and UV B radiation like a mirror. It rubs in clear as the Zinc contains holes that make it see through. Glyceryl Isostearate (Emollient) Glyceryl Isostearate is a Glycerin based Emollient, that helps soften and smooth the skin, while also helping prevent water loss. Niacinamide (Vitamin B3) Niacinamide is a form of Vitamin B3. When topically applied, it is proven to help prevent hyperpigmentation from sun damage. Rubus Idaeus (Raspberry) Seed Extract Red Raspberry Extract contains very high levels of Vitamin E as well as Vitamin A and Omega 3 and 6 Fatty Acids. This reportedly helps provide extra protection from UV. It is also very soothing and relaxing to inflamed skin, making it excellent for sensitive skin and any irritation. Glyceryl Stearate (Emollient) Glyceryl Stearate is an organic molecule used as an emulsifier and a skin conditioner. Potassium Sorbate (Natural Preservative) Potassium Sorbate is the Potassium Salt of Sorbic Acid. It is a natural preservative, and used as a mould and yeast inhibitor. Caffeine Caffeine is found in the seeds, nuts, or leaves of a number of plants native to South America and East Asia. Most commonly known as a stimulant, research also shows caffeine to have soothing and antioxidant properties. Many studies also show the protective effects of topical Caffeine which support the concept that topical application of caffeine may partially diminish photo damage as well as photo carcinogenesis. As well as providing a barrier against UV, our formula also includes ingredients to help protect the skin from any UV damage that can still occur. Hyaluronic Acid We source our Hyaluronic Acid from cotton or wood cellulose. Hyaluronic acid is used in skin care for its moisture binding and hydrating characteristics. We use a low molecular weight of the ingredient in our products. That there is only one main compound in Green Tea called "EGCG" that is responsible for most of Green Tea's amazing properties? The rest is just mostly leaf matter. So although "Green Tea Extract" on a label could be just a tea bag dipped in water, we purchase 98% Pure EGCG which is so concentrated it is looks like this white powder. It is expensive too, but if you Google "EGCG UV Radiation" you should see why we think paying extra for the real thing is well worth it.